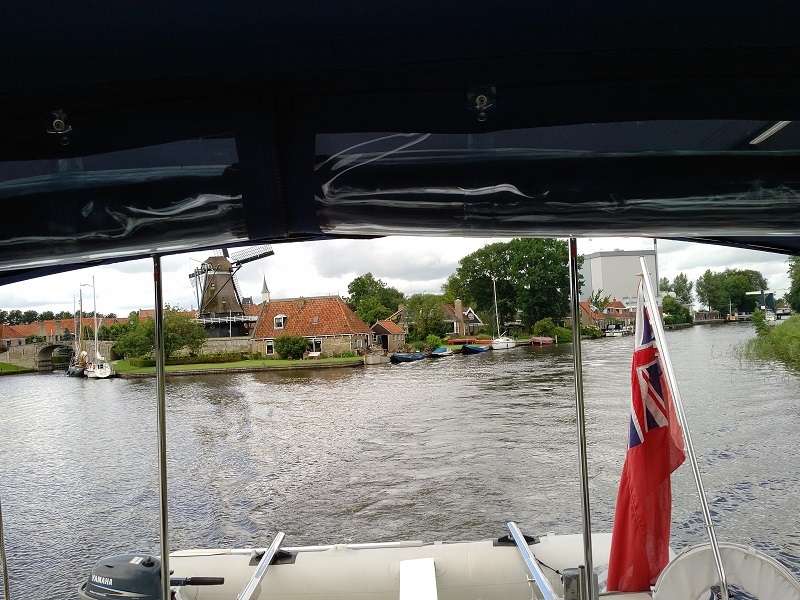 A day that started and continued wet and windy until the fair and sunny weather came later in time for us to cruise back from Sloten to Sneek after Sieb had called me and we had diagnosed the problem as needing attention. It was raining again and, when the worst of it had passed, I was walking Max when the Sneek engineer Sieb called me and we discussed the water pump problem again and I said that I could not rule out his very plausible explanation that the water tank pressure valve was to blame and so I would remove the floorboards and take a very good look at it. 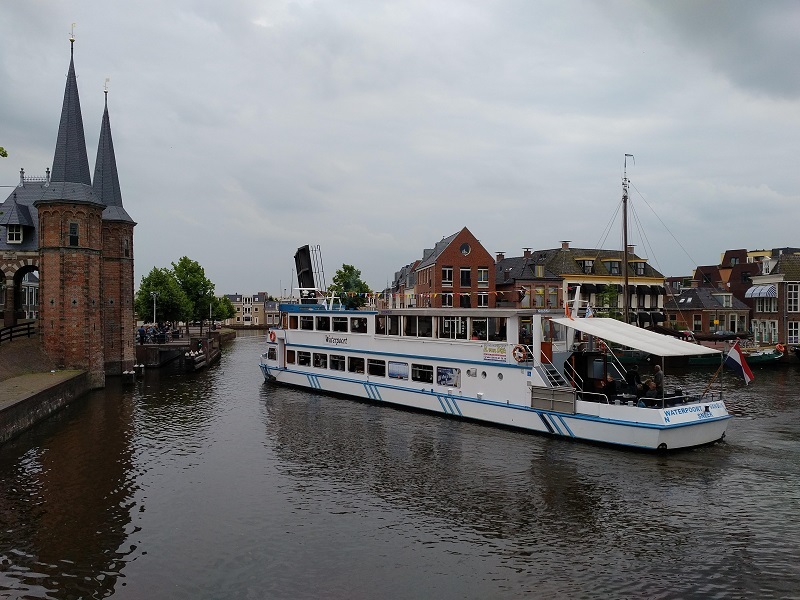 We brought Lady Martina in from the rural mooring on the outskirts of Sloten into the town centre and that was quite a cold and stressful experience for Kathleen as there was a strong breeze and her arm was hurting again. I took her into the town centre for some warming soup and a drink after the stress and we found a shop for our supplies before coming back with the weather still dull and damp. I decided to take the boat apart again and with Kathleen’s help, I got up all of the boat floorboards, mopped up such moisture as I could find and then was just about to give up, having found nothing, when I shone the torch under the water tank and saw some ripples. When I used a mirror n and took a good look, I could see water dripping and so the diagnosis was made; the tank enclosure had a leak somewhere. I called Sieb and we concluded that we should only use the pressurised water when really needed, and to leave the pump off at other times, and he wanted me to bring the boat back to Sneek, which I said that I could do in a couple of days. After this call, we put Lady Martina back together again and I decided to start making our way back from Sloten to Sneek today after all. 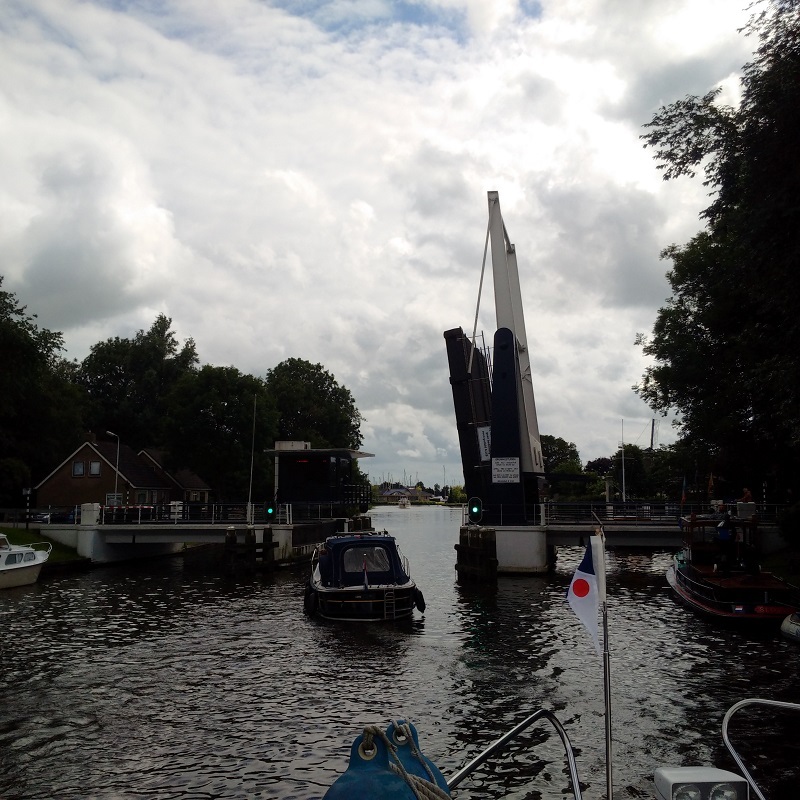 We dropped off first at the field mooring (where we had stayed at the night before) and gave Max a good walk and then turned back, through the lifting bridge in Sloten and headed east to join the Princes Margariet Kanaal. This fast through route, linking Friesland with Germany, had 7m high bridges and so there were no more obstructive structured between us and Sneek as even our VHF aerials only need 6.6m. The skies cleared, the sun came out and we actually enjoyed the cruise which took us around two and a half hours until we arrived in the centre to seek space in our former moorings. To our surprise, our newly-made Aussie friends, Craig and Cathy were there and helped organise other boats to move to give us space. We were so glad to be back and they came on board and spent the whole evening with us; Craig joining me for a trip to the pub for football and Cathy staying on board drinking and chatting with Kathleen. The weather started sunny the following morning and was much better than the day before and so we resolved to wash our bed linen which had been used for a month! The weather soon changed with the rain returning but it cleared up later and the job was done, the bed mattress was turned and we then received Sieb on board to learn of his opinion about our water leak. After some time looking with a torch, we agreed that the leak was originating from the tank itself and that it would need replacing but unfortunately this would be a major project for which Sieb would not have the time, we also agreed that the leak was slight and so it would be best to carry on using Lady Martina and its hot water tank for the time being and just turn the pump off when not in use to save water and any further deterioration. This agreed, we went and did some food shopping in the nearby Jumbo superstore and then moved Lady Martina around to the other side of Sneek for a change of view and chance of some internet coverage. We navigated the three lifting bridges without problem and then moored up just within sight of the Waterport where we saw the very large trip boat navigating the nearby bridge with great care.